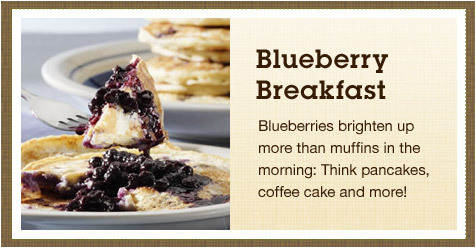 Blueberries have a long history at the breakfast table: lightly sweet with a gentle tang, they dominate the muffin world. But these super healthy berries, widely available fresh, frozen and dried, can do more than muffins alone. Whether made into a sweet sauce to top pancakes, a blueberry-bright coffee cake, or a blueberry cheese Danish, these little blue berries are just what your breakfast is looking for. Ricotta cheese makes these flapjacks deliciously creamy. This simple recipe can be a little fancier baked in mousse rings. Layered with blueberry preserves, this coffee cake is as sweet and moist as they come. Contributed By:Cay, OH Bake a lighter, low-calorie muffin. Blueberries, lemon zest and cream cheese make a creamy, bright filling. If fresh blueberries aren’t available, frozen blueberries work just as well in this recipe. With just four ingredients, homemade syrup is easier to make than you think. Luxurious coconut and macadamia give this baked blueberry tropical appeal. Whole wheat flour and low-fat buttermilk make this bread a healthy breakfast choice. This whole wheat pancake mix can be stored for up to three months in the freezer. Classic corn muffins are made healthy with yogurt, wheat germ and blueberries.